Ad revenue for 2017 is projected to reach $2.81 billion. User engagement with brands is 10 times higher than on Facebook, and 84% higher than Twitter. 50% of Instagram’s users follow at least one brand. 70% of the most used hashtags are branded. Add to this picture the fact of Instagram’s new shoppable photos feature and it becomes apparent that the platform is going to dominate the social marketing landscape in the coming years. With all this attention on Instagram for business, though, comes a downside. Brands are going to have to work harder than ever to get noticed, let alone sustain engagement. What’s bad news for brands is good news for influencers, though. 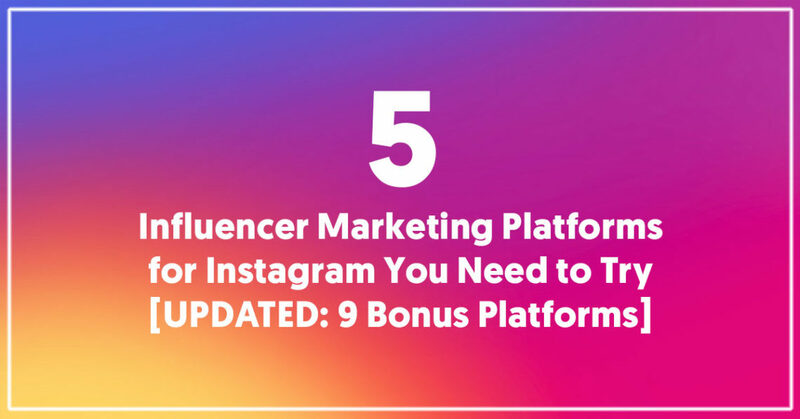 There are over 500 million active users on Instagram, and companies are going to have to increasingly funnel their message through influencers if they want to reach the right audience. 2017 will be a kind of gold rush for influencers, as brands will race to stake their claim on as many and as diverse a group of them as possible. With that rush will come the need for the right tools to locate and vet new talent, while needing to manage multiple campaigns and the people involved. With this in mind, finding a decent influencer marketing platform becomes of paramount concern. Keep in mind, though, if you’re targeting Instagram as your platform of choice, simply searching for the “best” ones won’t do. Some platforms are better than others when it comes to finding the stars who shine brightest on Instagram. 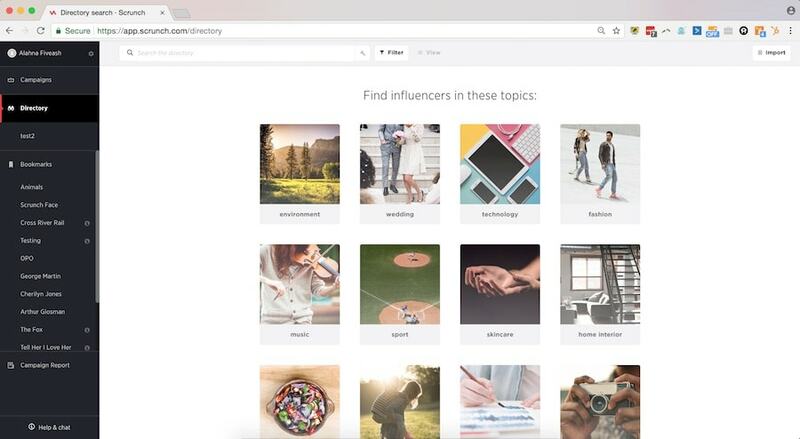 Upfluence is a self-service influencer discovery platform, targeting influencers on all of the main social channels, including Instagram, as well as the blogosphere. It comes at a comparatively low cost compared to many of its competitors, bringing it into the realms of small and medium-sized businesses. Despite this, Upfluence can claim numerous big-name clients, including Microsoft, PayPal, Ralph Lauren, and AXA. 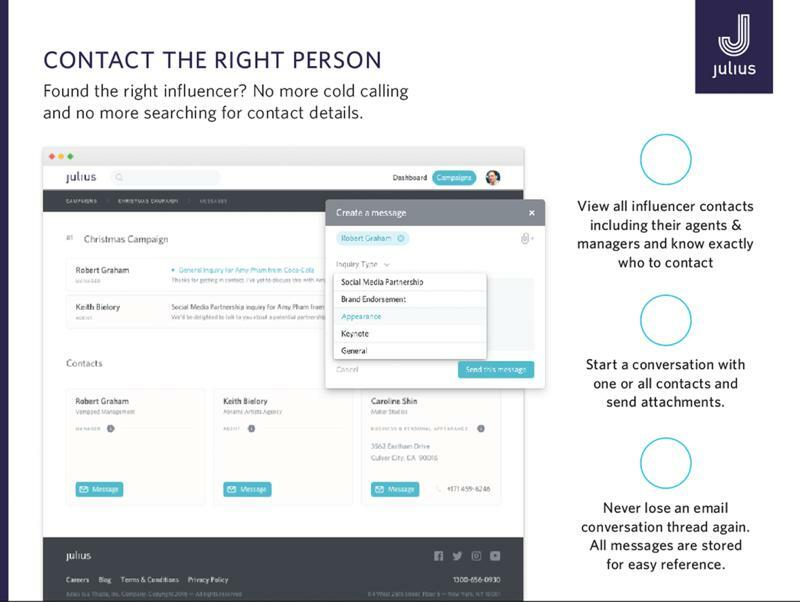 Although the highlight of Upfluence’s offering is undoubtedly its search software, you can do much more than just hunt for influencers. Their software allows you to manage your preferred influencers into lists. It gives you full access to their personal contact details. You can even export their details in bulk and contact them at scale. The Upfluence database is mind-boggling. Its algorithm indexes over 500 million items of content, and analyses each piece for reach and engagement. This means that you can search for influencers using any imaginable keyword. You can drill down your searches to very long-tail terms. Upfluence originally grew out of two tools, Façade – the search engine, and Publishr – an influencer marketplace. The marketplace is now gone, but many of its management tools remain. This means that Upfleucenr offers a range of tools to ease the complications of finding and making contact with influencers as well as keeping track of the success of campaigns. CEO Jesse Leimgruber and CMO Misha Talavera first pitched the idea of NeoReach while studying at Stanford University. They proposed NeoReach as a way to connect brands with social media influencers. The idea proved popular, encouraging Leimgruber and Talavera to develop their vision. They were able to generate $1.5 million of seed funding by 2014, turning NeoReach into a reality. Brands who wish to use NeoReach pay an annual fee, which is customized to each firm’s needs. NeoReach targets large companies with sizeable marketing departments. NeoReach finds its influencers by using a sophisticated algorithm that mines the social web for relevant data. As a result, influencers do not sign up for the service. But anybody who is a genuinely influential will most likely find they have been included in the 3 million people in NeoReach’s database. One of NeoReach’s main focuses is on providing an extensive array of data. You can search for posts relating to a selected keyword, and NeoReach will find you the influencers who often have online conversations about that keyword. You can refine your research on a wide range of factors, including demographic and psychographic features. NeoReach uses AI to determine what will be the best results for you. It learns from your searches, so the more you use the platform, the better you will find its suggestions. Once you have found suitable influencers, you can use NeoReach’s campaign management tools to assist you to manage your campaigns. NeoReach has developed their own method of calculating your ROI. They call it Influencer Media Value (IMV), and it aims to show the real value of your influencer marketing campaigns. AspireIQ is maturing as an influence marketing platform and is improving its feature set regularly. It has always had particular strength with its influencer management tools, which are robust enough to attract high profile clients. It provides tools for all stages of an influencer marketing campaign. These include Campaign Creation, Campaign Lifecycle Management, Digital Term Sheets, Product Tracking, Content Collaboration, Trackable Sales Links, Creator Performance Spreadsheet, Campaign Analytics, and Payments. This has to be one of the most comprehensive management toolsets available. Over the last year, AspireIQ has worked on improving its influencer discovery search engine and processes. Influencers can request to be included in AspireIQ’s database and are vetted before they are accepted. However, AspireIQ has created a more extensive database of influential people. They use an algorithm to add to the list of potential influencers they offer to their clients. They currently have 500,000 people in their system who they believe are authentic influencers in at least one niche. Clients can search for influencers using an extensive range of criteria. However, they also provide the “Quickmatch” feature as an alternative way to find influencers. This is similar to a “Tinder for Influencers.” If you navigate to the Quickmatch tab, it will present you with an influencer who meets your preferences. You can either show an interest in this person or opt to Skip and take a look at another influencer. When a campaign finishes, AspireIQ allows you to add high-performing content to a Favorites list, you can use for future reference. There are also tools that will enable you to repurpose campaign content into paid ads. Hypr was established on the assumption that if you are investing in influencers to create and distribute content for you, you should know as much as possible about their target audiences. It is targeted at larger businesses and offers four pricing levels – Standard, Pro, Platinum, and Enterprise. The tiers provide different limits on monthly searches (unlimited for Pro upwards), lists, access to contact information, exports, and user logins. Hypr has built a database of 10 million influencers and has full demographic data for their followers. They call themselves the Google of influencer search engines. At Pro level and higher, you can do searches using a wide range of keywords or demographic factors. 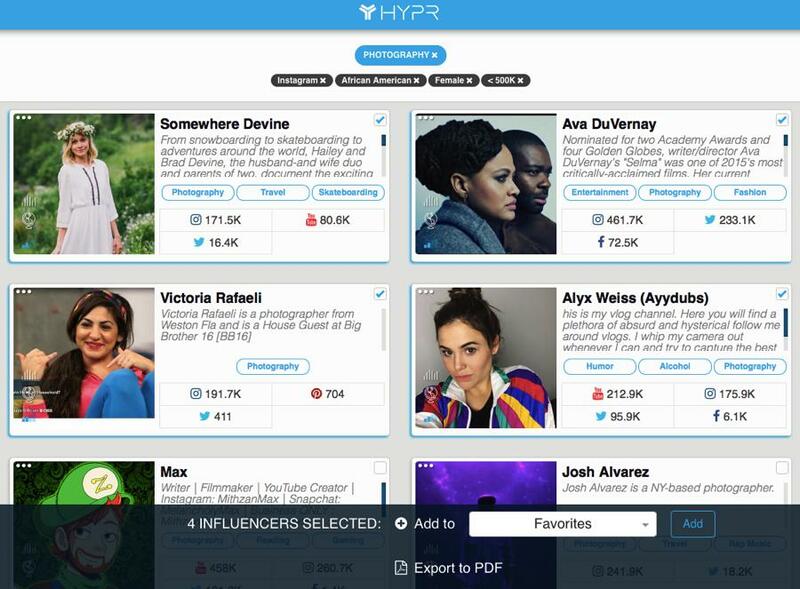 Once you have done your search, Hypr provides tracking cards for each potential influencer. They give detailed information about the influencers and their followers. This makes it easy to find potential influencers whose followers are a match for your target market. You can create various lists to help with your influencer selection. Julius grew out of Thuzio, a web-based talent agency for athletics wanting to increase their sources of income. It is now a fully-features influencer discovery and campaign management platform – for all kinds of influencers. Julius has over 50,000 influencers in its database. It does not just rely on an algorithm but uses humans to research the credibility of each potential influencer. It has an opt-in database, which means that everybody you find has expressed an interest in participating in influencers marketing. 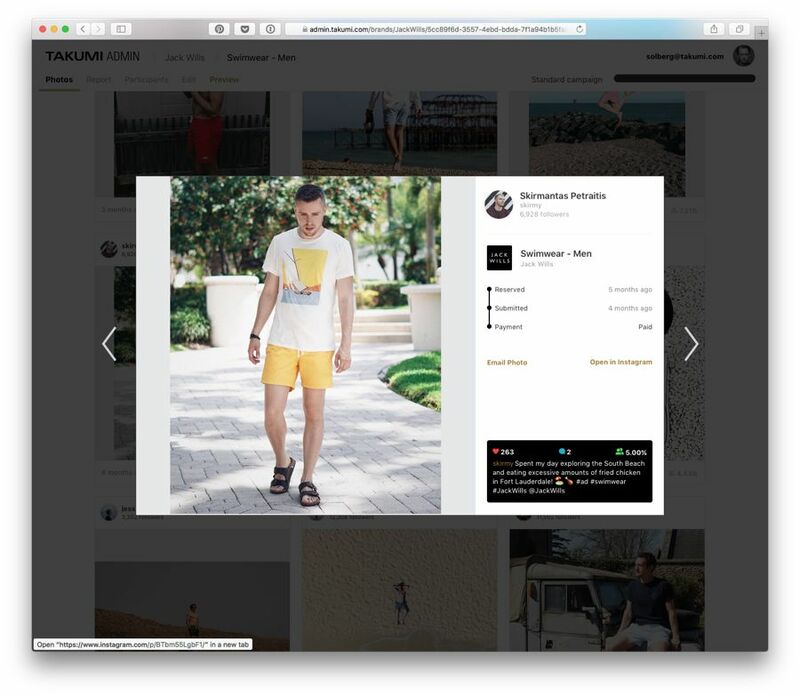 Much of the influencers are represented by talent agencies who have partnered with Julius. Julius features a clean interface that is easy to use and understand. Despite its apparent simplicity, Julius has an in-depth search engine, and you can refine your search criteria in many ways. There are more than 50 data points you can use to modify your search criteria. You can compare up to five influencers at a time to help you determine which is the best fit for your target market. Open Influence (formerly InstaBrand) is more of a creative agency, acting as a kind of middleman between brands and influencers. This makes a lot of sense, given their stated goal of “making ads more human.” Open Influence clients can use their “Intermix” search engine to find collaborators, which contextualises an influencer beyond the number of followers she has and the verticals she aligns with. Their database of over 100,000 influencers cross references keywords and post performance, analyses engagement rates and locations—it’s a big data engine for finding the perfect marketing match. By drilling down into each profile, Intermix is able to reveal influencers on any platform clients want to hit while filtering for other criteria. This is not a self-service company by any means, though, so if you’re looking to just find your talent and then execute on campaigns, Instabrand won’t be a good fit. On the other hand, if you want a company that’s going to manage your marketing with a human touch, with a core of technology that both defines and reports on the campaigns, Instabrand has plenty going for it. They describe themselves as a “mobile-first influencer company,” and as such place greater emphasis on mobile-only platforms like Instagram and Snapchat. Doveltale is still a new influencer discovery platform, barely a year old. Founders, Mike Schmidt and Navied Shoushtarian, were concerned that most of the influencers platforms at the time catered to large businesses and were outside an affordable price range for small businesses. Schmidt and Shoushtarian initially saw Dovetale as an all-in-one answer for influencer marketing, but they have since deemphasized campaign management. You will find that you have limited campaign management options within Dovetale once you have got your campaign underway. Dovetale encourages you to start your campaigns by researching your own audience. It provides detailed data for your social accounts, Instagram in particular. You can monitor follower growth, engagement, gender, locations, and age. You can make a similar analysis of your competitors’ social accounts. This research can help you formulate your influencer marketing strategy. Dovedale also includes The Monitor, a social listening feature, which helps you identify influencers who identify with your (and your competitors’) posts. The platform has a real strength with analytics. In addition, you can connect to Domo which give even further opportunities for data analysis. You can do two levels of influencer search. A standard search allows you to search the Dovedale database for suitable influencers. If you make an Advanced Search, though, you can search for influencers outside Dovedale. It even includes an image recognition feature. You can search images both by content and by aesthetic – making it easier to find influencers who match your style. Scrunch was founded by Danielle Lewis in late 2015. Since then it has improved its product offering. It enjoys an arrangement with News Corp to offer influencer services for luxury brands. Unlike many of the other platforms profiled here, Scrunch uses a freemium pricing policy. You can manage small campaigns on its free plan, although most users will prefer the Pro ($99 / month) or Power ($299/month) price levels with more options and fewer limitations. Even the higher level plans are cheaper than some of the opposition’s lowest prices. This makes Scrunch ideal for small businesses. Yet, possibly due to the alliance with News Corp, the platform is also popular with well-known brands and big-name clients, such as Mini and Vogue. Scrunch has a database of 20 million influencers, so you are likely to find influencers, no matter what niche you operate in. With such an extensive database you may have to look closely at your results to find the best influencers for you. Scrunch has useful campaign management tools. They have integrated the discovery tool into the Discovery section, making it easier to shortlist potential influencers. You can take notes on influencers and add them to their profiles. The reporting tools depend on your subscription level but are sophisticated. A Power level subscription or above gives access to tools robust enough to impress even the most significant clients. Co-founders, Mat Stigzelius and Solberg Auðunssons, began Takumi in early 2015 in recognition that there was a gap in the market. Businesses could easily find and make contact with celebrities (if they had deep enough pockets). At that time, though, there were not many tools available to help businesses find and make contact with micro-influencers. Takumi has developed an impressive customer base, with companies like Sony Music, Hilton, Procter & Gamble, and the BBC amongst their clients. A brand begins a campaign by defining it – deciding on its objective, timeline, budget, and other vital details. Takumi uses its algorithm to recommend the best influencers for the job. Influencers are notified of new campaigns and can indicate whether they are interested in being involved. Suitable influencers then create appropriate content for the campaign. They are only paid if their content meets the guidelines. The content goes live according to a campaign’s timeline. Tapinfluence is one of the more established influencer marketing platforms and has been around since 2013. It grew out of a tool designed to connect bloggers, known as Blog Frog. The company changed course because they noticed the reduced effectiveness of banner ads and they wanted to be part of a marketing company that could show clients how to receive a positive ROI on their spending. Tapinfluence can now claim an impressive roster of clients, including Whole Foods, Seiko, Canon, Volvo, and Target. They do target their product more at larger businesses with sizeable marketing budgets. 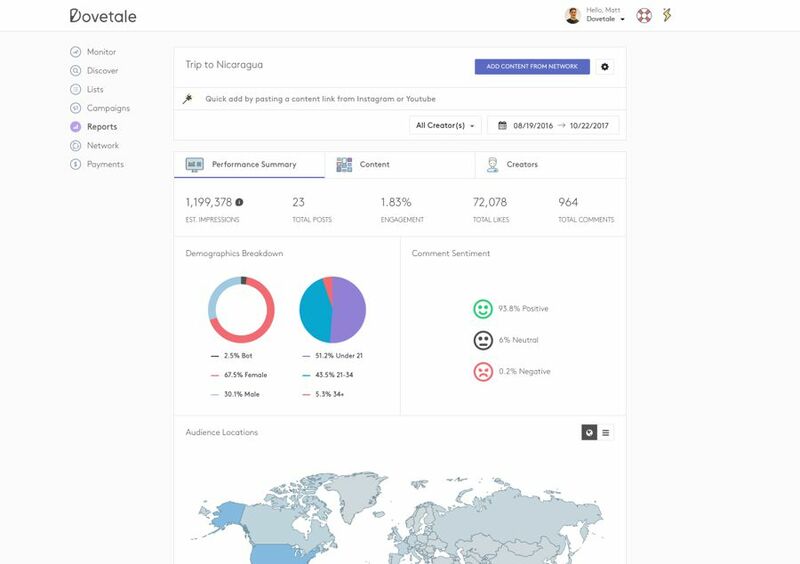 Tapinfluence includes all four of the main features of an influencer platform: influencer search, influencer outreach, analytics and campaign management. Its most celebrated area of strength is its set of campaign management tools. They are amongst the most comprehensive tools of ay influencer marketing platform. Tapinfluence allows firms to scale their influencer marketing with ease. 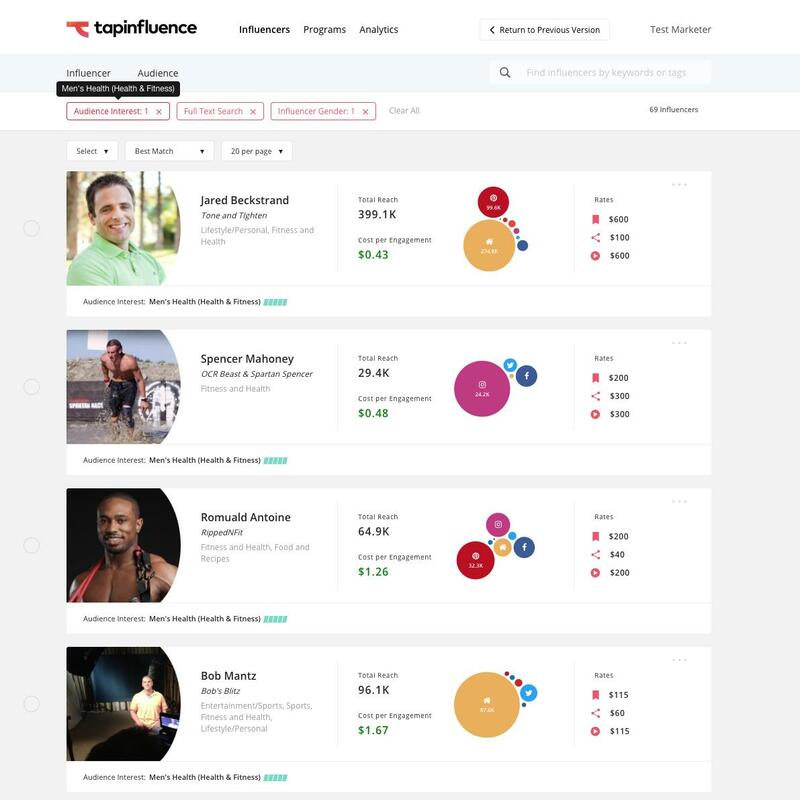 No matter how many influencers you choose to work alongside, Tapinfluence will help make the process manageable. Tapinfluence offers an additional service, TapFire. This assists you to amplify content to reach audiences with a minimal amount of work. Onalytica was established in 2009, making it one of the earliest companies to involve itself in influencer marketing. They use a combined human/hybrid approach for influencer identification. They use a proprietary algorithm to scrape relevant details from 200 billion social posts per year which they then index into their database. However, they use a human team to scrutinize these results, ensuring that users only see relevant results. Onalytica has curated lists of influencers for popular categories, such as Fashion, Food, and Lifestyle. Everyone on these lists has been vetted (by a human) to ensure they are a good fit for the list. Searchers can also search for influencers by platform, demographics, or content. You can upload your content to Onalytica, and their software will do its best to find influencers who have written material in a similar voice to your own. Onalytica provides you with a vast amount of data relating to potential influencers, including a wide range of charts and graphs. An agency that sits on top of a platform, Hypetap gives brands the best of both worlds—one world at a time. By that, we mean that a company can choose to do their own marketing and have access to the software platform, or choose to go through their agency and have the whole processed managed by Hypetap team. The platform offers the kinds of tools you’d expect: data-driven lists of influencers who aren’t just sitting on a pile of followers, but are creative forces in their own right. In fact, the Hypetap talent pool is among the smallest we’ve seen—less than 2,000 influencers. But this shouldn’t be seen as an obstacle. Hypetap’s influencers are there by invitation only. Once they’re in the system brands (or Hypetap’s own agency) can easily search through available influencers without scrolling through page upon page of possible matches. Another selling point for brands and influencers is the free access they get to the platform. There are no fees for creators to sign up; likewise for brands looking to skip the agency’s help and work on their own. Brands post campaign briefs and describe their ideal target audience. From there they can search for influencers, or—just as likely—influencers will find them. Rates are negotiated, terms are set, content is created, campaigns are executed, and everyone wins. Including Hypetap, which takes a 10% cut of the deal. There’s also a DRM component, where digital rights for any content are assigned at the execution of a campaign. This is especially important for Instagram content, as a stunning photo can have a much longer shelf life than a written piece. We’ve profiled this company before, but they deserve another mention here. Famebit is fairly no-frills in its offering: a basic platform where brands meet influencers and contract out the content they need created. Everything about the way Famebit markets itself, though, tells you everything you need to know about the platform. Their talent and focus skews young, as do the campaigns that are born on Famebit. Videos, comedy sketches, fashion photography, tutorials—brands looking to reach out to the younger, disposable-income-having audience that dominates Instagram are going to find great matches here. Like Hypetap, there’s no fee to join, and the platform serves a meeting ground for potential collaborators. Famebit is more open in who they let on to the platform—be prepared to search through a much larger pool than Hypetap is offering—but they’ve put such tremendous effort in styling their own brand to attract the right talent, it’s not surprising they’ve got a happy roster of companies using their services. There’s something to be said about a company that’s clever enough to effectively market their own marketing platform, which makes Famebit definitely worth a look. And speaking of companies that are effectively marketing their wares, Tribe rounds out our list as a must-see for companies looking for Instagram influencers. The website looks more like an Instagram feed of attractive young people having the time of their lives. But underneath that all is Tribe’s clever use of a mobile app to bring engaging content to brands. Tribe’s users, the influencers, use an iOS app to generate content for brands that they love—most often a simple mention. If you’ve got 50,000 followers and are about to post a picture from Times Square in NYC: hold off. Post that picture to Tribe instead, and see if Coca-Cola will pay you for having their logo in the background, with a mention. That’s the basic premise of Tribe. It’s not focused on long term campaigns or promotions, but one-off shout-outs that brands can use to gain some attention. Of course, billboards in the background is just an example, and not a good one if you’re an influencer looking to make cash. You’ll do better when a product is featured in the post and it comes across as organic occurrence. Right now, the app is focused on Australia, but as it picks up steam—especially with global brands—look for it to spread beyond the great Down Under.